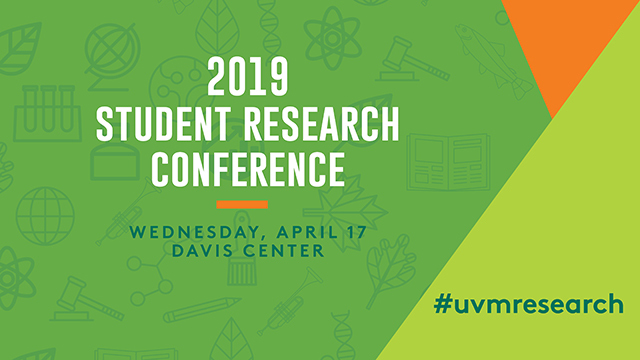 THE UVM STUDENT RESEARCH CONFERENCE (SRC) IS A SHOWCASE OF STUDENT RESEARCH AT EVERY LEVEL AND ACROSS EVERY DISCIPLINE WITHIN THE UNIVERSITY OF VERMONT. This showcase is a public event held annually in the UVM Davis Center. We encourage any and all students, staff, faculty, and community members to come and support the wealth of innovation and creativity being exhibited at this event. Schedule of Events can be found: UVM Compass. List of Social Sciences presentations, alphabetical by presentation title. List of presentations in the poster formatted presentation across four sessions. List of presentations in the oral format within five rooms. See all oral presentations here. List of Health Science presentations, alphabetical by presentation title. List of presentations to be presented across three sessions in this topic area. List of Food & Environmental presentations, alphabetical by presentation title. List of Engineering & Physical Science presentations, alphabetical by presentation title. List of presentations in the creative format within the Humanities Center Creative Lounge. List of Biological Sciences presentations, alphabetical by presentation title. List of Arts & Humanities presentations, alphabetically by presentation title.